When you’re only cooking for yourself, you’re not going to use the biggest pots and pans you have. You’re going to pick whatever is the right size for the job. 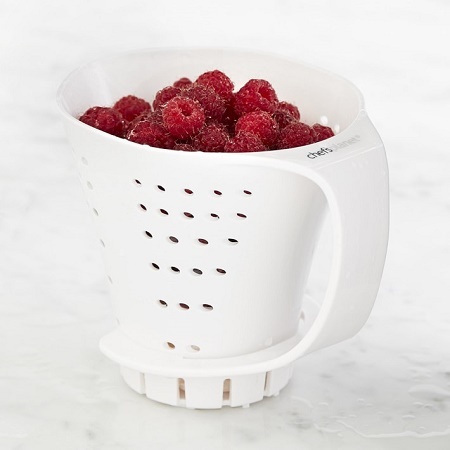 If you have to rinse your food, then you don’t want to pull out a giant colander for a cup or two worth of food. If you’re also portioning your food, you have to double your dishes by dirtying your measuring cups and other regular cooking dishes. If you are all about having the right tool for certain tasks, then the Handheld Measuring Colander is perfect for rinsing and draining whatever ingredient may need it. At the same time, it will also be measuring the amount of food by way of pints and cups. The measurements are delineated by way of the drain holes. It can hold up to 3 cups of food, and thanks to its molded high-impact ABS plastic construction, it can handle hot or cold foods alike. If you like canned tuna or fruit, you can also flip this over to help strain out the juice from the can. There is a pour spout, though it likely won’t see much use since the liquid will be coming out through the sides. You can either hand wash this, or put it on the top rack of the dishwasher, though it will likely be used more than your other cookware. This will cost you $14.95, and is sure to be useful if you frequently cook for yourself.